At Gracious Care Agency LLC, we know that no two patients are the same. That’s why our home care services are tailored on a case-by-case basis. Our clinicians work with your primary Physician to develop a plan of care that meets your individual needs. To start the home care process, we will come to your home to discuss your case and address your concerns. Together, we’ll work to match your needs to our highly qualified, gracious and compassionate team of healthcare professionals. Gracious’ team of clinical managers will continually supervise and evaluate your case to ensure complete satisfaction. Who can have home care services? 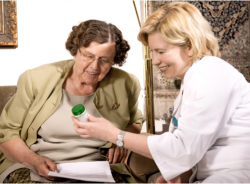 With a doctor’s order, Gracious Care Agency LLC provides home health care to any patient who needs care in their home. Our well trained staff includes nurses, therapists, social workers and aides working as a team to help you through health care issues and improve your health. How can you arrange for Home care? Anyone (a patient, a relative, physician, therapist) can call 978-365-3323 at any time to arrange for services. Our office will set up a time for assessment with the patient and stay in contact with your physician for ongoing medical orders to meet your health care needs.